A transmedia campaign is only as good as its co-creators. Many originators—filmmakers, authors, musicians—are excellent at their art form, understanding how to use the medium to its best potential. Instead of forcing them to fumble through new and unknown platforms, it is much better to partner with creators who hold an expertise in those areas. These co-creators can advise and produce excellent extensions, fully utilizing the benefits of other platforms. Co-creations can assist in other ways as well. Partnerships allow for budget sharing, spreading out the costs to allow for larger projects than the musician or record label may have been able to shoulder on their own. If these are innovative endeavors, with partners of significant clout, sponsorships are an additional possibility, allowing a third party to take on part or all of the budget in exchange for some branding or a few moments with the users. This is the origins of Soundplay, a collection of browser-based games inspired by music. Pitchfork, a music website, partnered with Intel to commission independent game developers to create games for specific songs, often from albums that were about to be released. 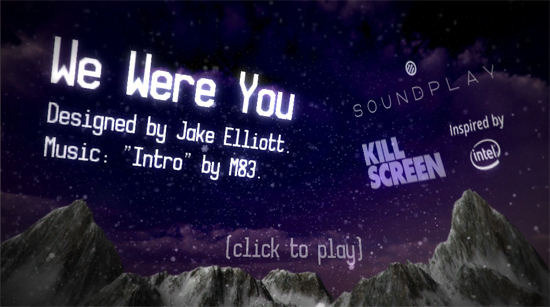 The games were produced by Pitchfork’s sister site, Kill Screen, a blog about videogame culture. The games range from very literal to totally abstract interpretations, acting as portals into new worlds for fans to explore the songs from the inside out. “Street Song” was created around Matthew Dear’s song of the same name. A helmeted traveler stands alone in a seemingly barren desert, unsure of where to proceed. 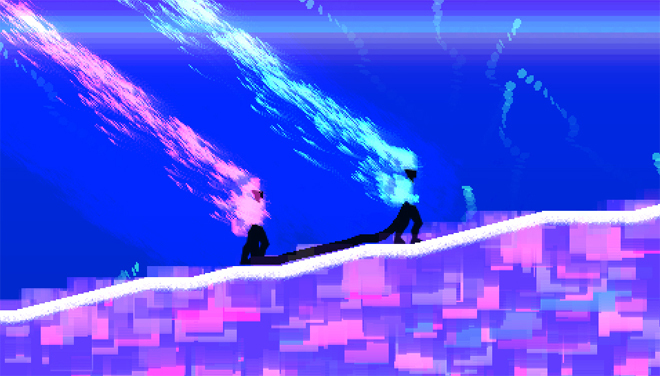 The player directs him through the landscape, dodging obstacles to explore the mysterious buildings in the distance. 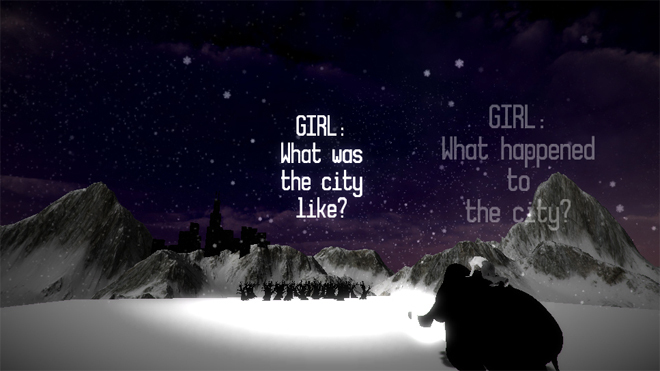 “Street Song” was created by the Italian game design studio Santa Ragione, who previously created “Mirrormoon” an ambient space exploration game. “Sun God” was produced for Cut Copy’s song of the same name. Two characters, connected by rope, pull each other along an abstract slope. They can move along faster and catch glowing lights if they work together well. The game can be played by one person or two people, each controlling one of the pair. The dynamic between the two characters harkens to a seeming exchange going on between two people in the lyrics of the song. “Sun God” was produced by Bennett Foddy, former bassist for Cut Copy, and most famous for his games QWOP and GIRP, which have been shown at the Museum of Modern Art. 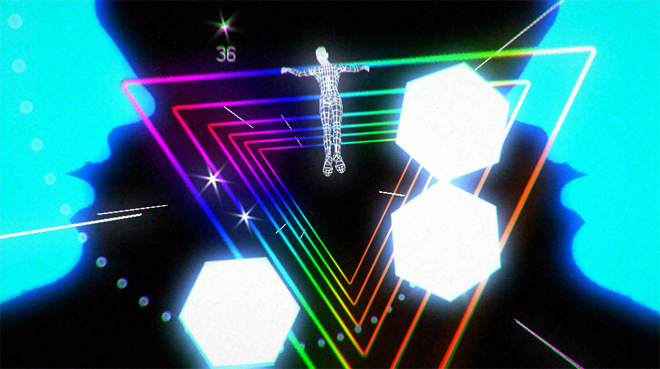 “Geometry of Love” was inspired by Chromatics’ “Lady.” A female figure falls through space, passing through various shapes to collect stars while avoiding geometric obstacles. The synthpop feel of the song is reflected in the aesthetic, with early 80’s style effects and coloring often associated with the subgenre’s heyday. The game was produced by Ivan Safrin, who has created interactive installations for the likes of the Hayden Planetarium, as well as collaborations with musicians MNDR and Blonde Redhead. “Take a Walk” was created for Passion Pit’s song of the same name. 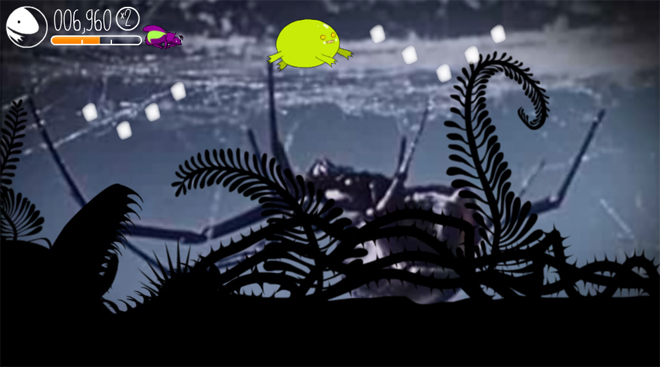 The player begins their journey as a little bug, but as points and ooze are accumulated, the character evolves into a frog and then a chicken. 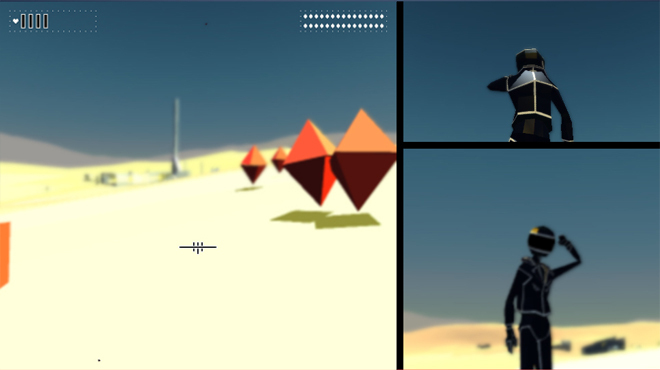 As the player changes, the footage in the background moves forward in time, from the formation of Earth to present day. “Take a Walk” was produced by Pachinko Pictures, an animation company that has worked with TV networks, advertising agencies, musicians, and mobile game app developers. Each game is not merely an adaptation to a visual medium, but an expansion of the song in some form or fashion. The producers immersed themselves in the music and created a world around an element they wanted to explore. Some were literal elaborations on the lyrics, others abstractly dealt with tempo or aesthetic, but all gave a new way to experience the music. This is a win-win for the co-creators and the musicians. Both are exposed to each other’s fan bases: the musician’s fans will come for the music and may discover they enjoyed games more than they thought, while game fans will come for the experience and may come to enjoy music they’d never heard before. As for the companies involved, Pitchfork and Kill Screen further reinforce their expertise in this area, and Intel gains excellent branding with a generation that has been reared on all things Apple. The Internet has made it extraordinarily easy for artists of different media to overlap and collaborate. Hopefully these types of venues, where co-creators are given the time and space to explore someone else’s work, will continue to flourish.